Just read an article about the need to get rid of “gated content” – you know, content you have to opt-in to get. The argument was all your content needs to be given away for free. Like many of these “either/or arguments” online, the answer is not either/or, it’s both. Or in this case, all 3! 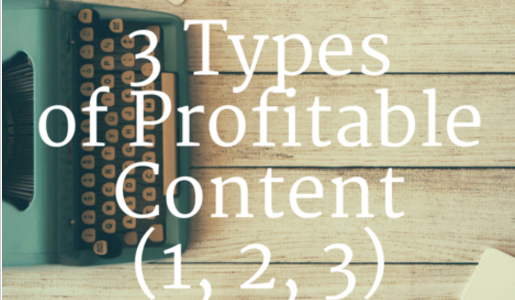 This is the content you use to get noticed, get found, and attract prospects. Your goal here is to deliver just a slice of your expertise, an appetizer. Some folks are afraid to do this because they fear “giving away the farm.” Relax, you can’t give away the farm with just a sample of content. Gated content is content that resides behind a “gate” – in most cases it’s content you opt-in for – trading your email address for something you want. 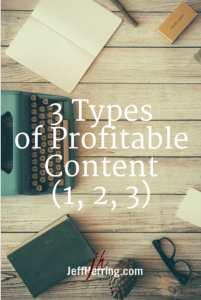 Here’s how you profit with your content. Turn your expertise into information “how to” products that you sell. One really cool thing about this model is when you are creating your “free” content, you are creating the seeds for your “fee” content too. So now how would you like 21 great content creation ideas? And when you’re ready to get cranking with consistent content creation, you’ll want to grab the Custom Content Wizard – push button access to 21 content creation templates and more!